black olives and sesame butter? really? did i mention the chili oil? the mint? it was only after trying it that i thought of spicy hummous, tabouleh with mint and parsley, and olives working together perfectly. but a taste of the sesame dressing and black olive in the same bite still woke me up every time i tried it. the flavours didn’t compete, they were quite nice together, just different, for me anyway. every extra drop of the delicious sesame paste was scraped into an air-tight container and set in my freezer for a future use. the paste is delicious and i can’t wait to use it again, whether with this salad, on soba noodles, or mixed into a curry. you could even use it as a dip–it’s so good that you’ll kind of want to have it straight from the bowl. i might have had a spoonful or two that way myself. sh headnotes: serves 2. this salad is absolutely made by the inclusion of my sesame paste (see below), which also appears in several other recipes. 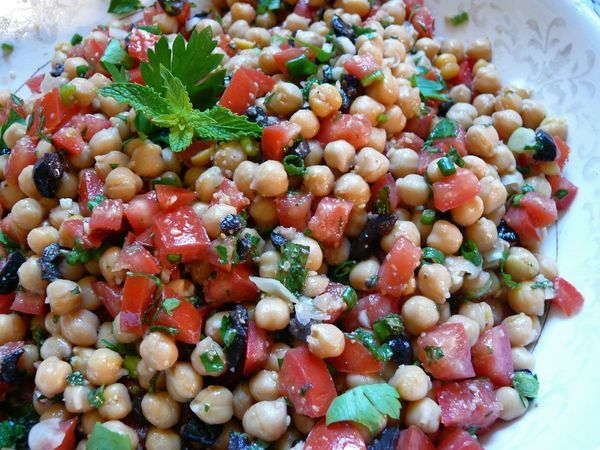 make sure the canned chickpeas are of a good pedigree–ideally a greek or middle eastern brand. also, if the olives are packed in oil, use this for the dressing. ys note: i made a large batch to bring to a potluck bbq–(served as a salad without bread). i tripled the quantity of chickpeas, sesame seeds and sesame paste used, but only doubled everything else. we ate it served at room temperature which i liked even better than when it was warmer. oh, and i saved the seeds and juice of the tomatoes to use in a sauce the next day. that’s the heart of the tomato and it’s delicious! for the dressing, lightly toast the sesame seeds in a dry pan over medium hear until fragrant, and cool slightly. 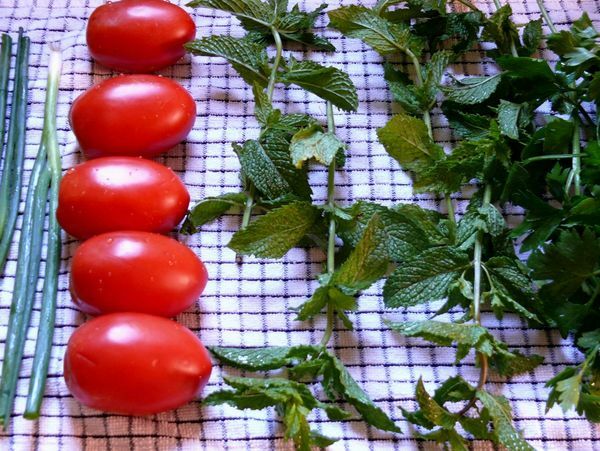 peel, seed, and chop the tomatoes and mix together with the rest of the dressing ingredients in a roomy bowl. tip the chickpeas into a pan, bring to a simmer, and heat briefly for a few minutes. drain in a strainer and rinse with boiled water from the kettle. add the hot chickpeas to the dressing, stir together, and serve, spooned over slices of toasted sourdough or country bread, if you like. sh headnote: makes about 1 3/4 cups. you need a powerful, small food processor to make this paste. for the best flavour, i feel it is important to use asian brands of chili and sesame oils. ys note: i used 1 tbs of chili oil skimmed from the top of my bottle of chili seed oil and it was enough heat for me–and you know how i like heat! try that first and work your way up if you want more. lightly toast the sesame seeds in a dry pan over medium heat until fragrant, and cool slightly. tip into a small food processor and add all of the other ingredients. 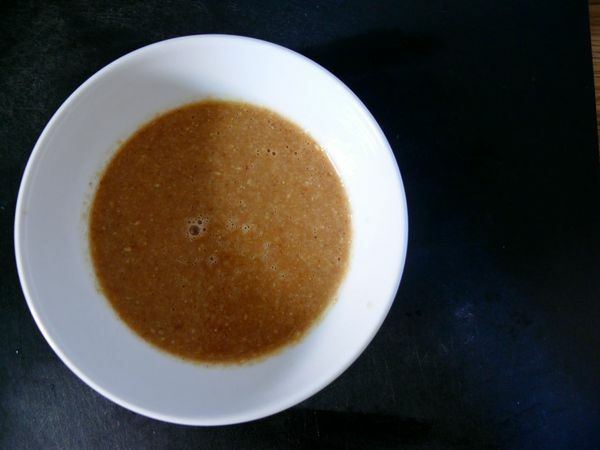 grind and pulse until you have a paste that is fully emulsified and super-smooth. pour into two small, lidded containers, smooth the surface, and trickle over a little extra sesame oil, to preserve the surface. put in the refrigerator, where the paste will keep happily for anything up to 1 month. or you could freeze one of them, if you like.